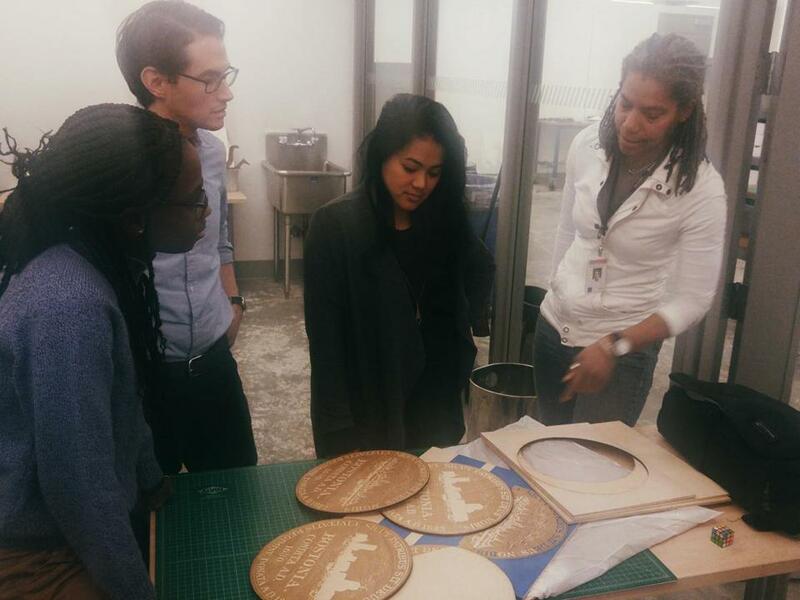 Sabrina Dorsainvil, Michael Evans, and Susan Nguyen of the Office of New Urban Mechanics looked over the seals with Judith Anderson, chairman of the industrial design department at MassArt. A professor at the Massachusetts College of Art and Design was tapped this week to create new city seals that will sit front and center on the lectern used by Mayor Martin J. Walsh during press conferences and other public events. Judith Anderson, department chairwoman of industrial design at MassArt, laser-cut several versions of the seal on Tuesday, using high-tech machinery at the school’s Design and Media Center, as staff from the mayor’s Office of New Urban Mechanics looked on. “Just another day in the office,” said Anderson, who worked for General Electric as a mechanical design engineer in the 1980s, according to a biography on the school’s website. A giant laser-cutting machine that moves back and forth like an ink jet printer did all the labor under Anderson’s watch. 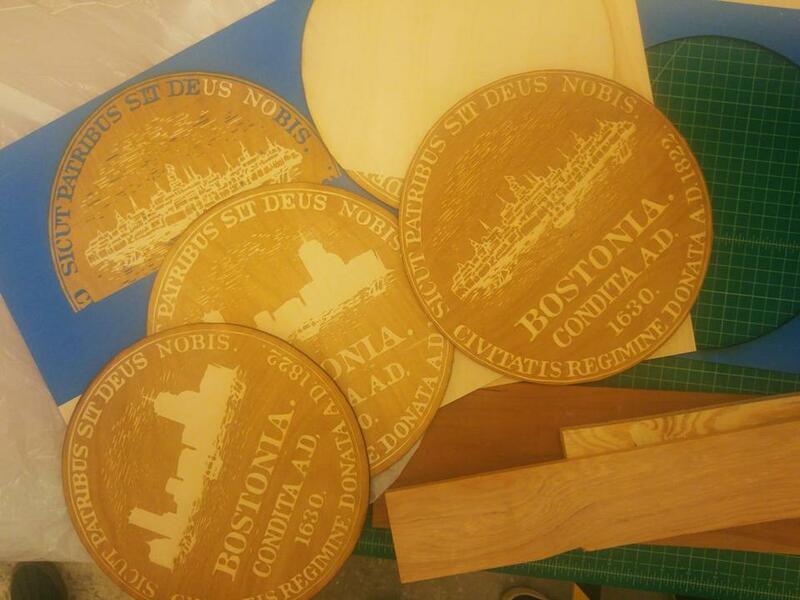 The beam etched in the image of the city skyline and the words “Bostonia Condita AD 1630” into the wood. Anderson said the city was in a bit of a bind because staff needed a quick turnaround on the project. For the past few years, a company out of Cambridge called danger!awesome had fabricated the seals for the mayor’s office. But the business, located in Central Square, was recently acquired and could no longer take on the job. City officials reached out to the Massachusetts College of Art and Design to fabricate the seal that will be used at official city events. Anderson said Sabrina Dorsainvil, a former student who now works in the mayor’s office and keeps in touch with the school, had reached out and inquired about MassArt taking on the project.